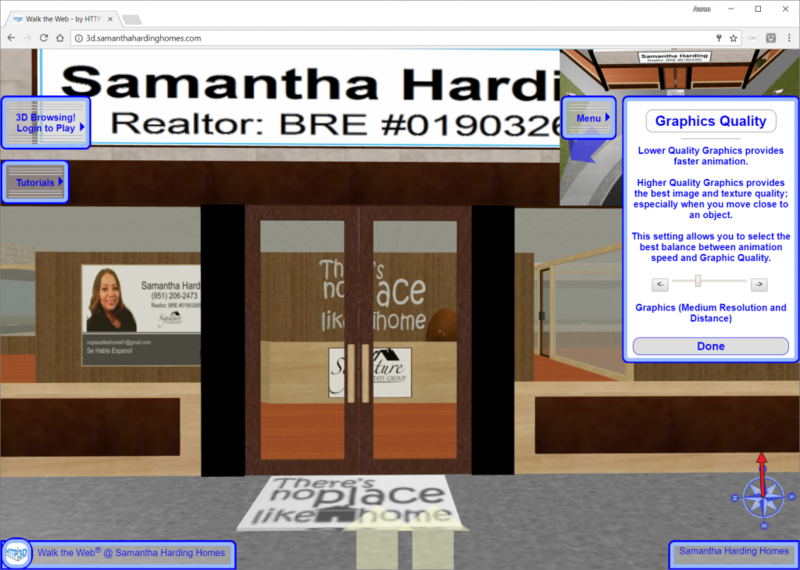 3D Browsing is designed to auto detect the setting for graphic quality based on your computer or mobile device. This process can use browser, device, CPU, Graphics Card, and/or memory available. If the system cannot detect your settings, it will default to the lowest graphic setting (often suitable for mobile devices). You can override this default setting by changing the graphic quality setting in the menu. Low resolution uses thumbnail (80 x 80 pixel) graphics to cover an area that simulates a 5 ft. by 5 ft. wall or half of a typical wall height. It may not be noticeable at a distance, but it will look blurry when you Walk close to the texture. Notice the globe in the image below. Medium resolution uses 256 x 256 pixel size graphics to cover an area that simulates a 5 ft. by 5 ft. wall or half of a typical wall height. This is more than 3 times better than the low resolution. You will start to see clarity when you Walk close up to an object. High resolution uses 512 x 512 pixel size graphics to cover an area that simulates a 5 ft. by 5 ft. wall or half of a typical wall height. This is more than 6 times better than the low resolution. This is the native 1 to 1 ratio of graphics size to canvas for the texture it is covering. Any higher graphics quality would require expansion of the canvas size put on objects. 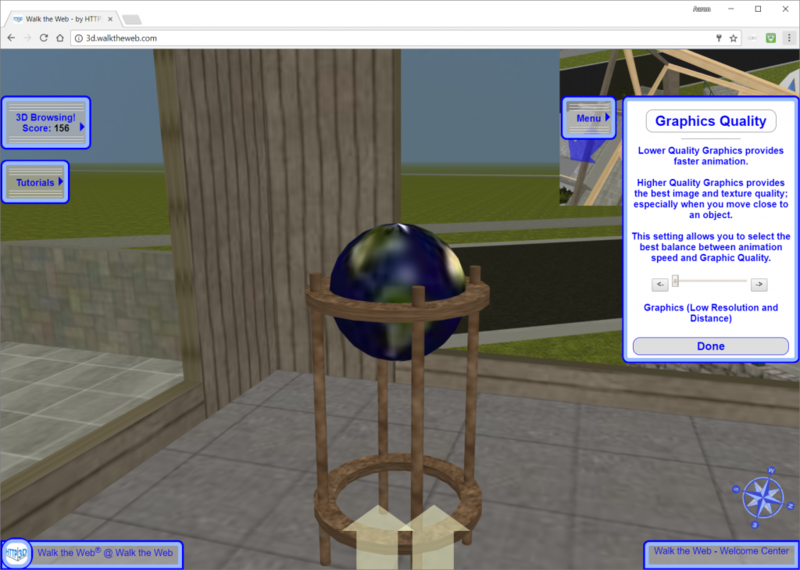 Notice the globe in high graphics compared to the globe from the low resolution setting. There is clarity and you can even make out some latitude and longitude lines. Currently this setting uses the High Resolution. This is a future enhancement that will take advantage of the original sized graphics as uploaded. We are also experimenting with increasing the canvas size placed onto the 3D Objects. Feel free to use this setting as High Resolution alternative and it will kick into extreme as soon as we release it. Another experimental part of the Graphics Resolution is custom distance settings. 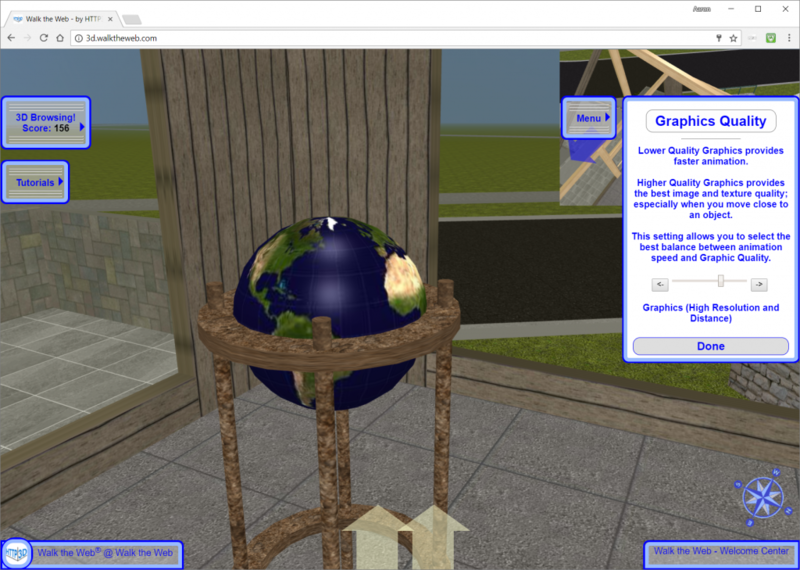 This is an experimental method of deciding how far the user can see (render 3D Objects) based on the performance for frames per second. If the computer is rendering fast, it could automatically add more distance to the view. The reverse concept is also true. The end goal is to have a smooth 3D Browsing Experience for all.